California immunologist Arthur Ammann pioneered research that drastically cut the HIV infection rate of infants. Arthur Ammann grew up in Brooklyn, New York, the son of working class German immigrants who had never finished grade school. But his parents supported his desire to go to college and become a doctor. And when he did, Ammann went on to lead a global charge to cut the HIV infection rate among infants. While in medical school Ammann found his calling in immunology. He learned how the body responds to infection and how to develop vaccines to protect people. "Immunology was just emerging at the time I was completing my pediatric training," Ammann recalls. In 1971, he became the first pediatric immunologist at the University of California in San Francisco. In the early 1970's, he and his colleagues were the first to complete clinical trials that led to FDA approval for the pneumococcal vaccine against pneumonia. He still considers that his greatest achievement. "The Gates foundation recently announced that they were donating $10 billion for vaccines, including a pneumococcal vaccine for children in poor countries," Amman says. "That's especially important now, as new, more dangerous flu strains emerge." "With the flu epidemic, people don't always die of the flu, the virus," he says. "They die of bacterial infection which is the pneumococcal infection. It's very important in this influenza epidemic to get the pneumococcal immunization to prevent pneumonia." By the early 1980's, Ammann's clinic had started seeing babies with compromised immune systems. He realized that their condition was similar to the mysterious and deadly disease that was destroying the immune systems of young gay men. Ammann worked with some of the finest minds in medicine to learn more about this acquired immune deficiency that became known as AIDS. They soon learned that there was a much larger epidemic outside of the United States. "We began to get preliminary reports from developing countries. We realized what we seeing in the U.S. was just the tip of the iceberg," Ammann says. The Human Immunodeficiency Virus (HIV) was identified in 1983 and a test for the virus in the blood was developed the next year. Since he had been successful at developing the pneumococcal vaccine, Ammann thought finding a vaccine for HIV would be a fairly uncomplicated process. But by 1985, frustrated by a shortage of research funds, Amman left his secure university post to join the biotechnology firm Genentech, where ample research resources were available. Seven years of work led to five patents but failed to produce an HIV vaccine. Ammann at work in Goma, Democratic Republic of the Congo. "The virus has something about it where we cannot respond to it. Our bodies are not genetically endowed with the ability to develop an immune response to this," Ammann says. Still, he remains optimistic that a vaccine will eventually be developed. "I think what the virus is telling us, with all the vaccine studies that have failed, is that we need to approach it very differently." One approach that has proven successful is treating HIV-positive mothers to prevent the transmission of the virus. Ammann discovered that if a pregnant woman is given anti-viral drugs, her baby is protected from contracting HIV. The anti-viral drugs are effective both in the womb and also during breast-feeding. Ammann says statistics confirm the treatment's effectiveness in preventing mother-to-child transmission of HIV. "In the United States, we've gone from thousands of cases of infected babies to fewer than 100. It's almost eradicated in the United States." Ammann attributes many of the subsequent advances against AIDS to activists and advocates who demanded government funding for research and drugs to treat the disease. 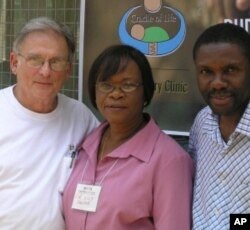 Cradle of Hope is a Global Strategies program to prevent mother-to-child HIV transmission in Ghana. As research brightened prospects for AIDS prevention and treatment in the United States, Ammann noticed the situation remained dire in developing nations. "The numbers we were getting from resource-poor countries were 1,600 babies infected every day. Every day. And that became for me another issue of justice and equity." Unable to secure funding to address that inequity, Ammann, who had worked with two AIDS research foundations after leaving Genentech, established his own organization in 1999. His group, Global Strategies for HIV Prevention, immediately went to work in major cities in Uganda, Kenya, South Africa, Nigeria, Tanzania, China and India, among others. Ammann then turned his attention to rural communities, which were bearing the brunt of the epidemic often because of civil unrest or war. "We've got to pay attention now even to these unstable areas that have very little infrastructure," Ammann says. Since it's nearly impossible to find doctors and nurses to train in those areas, Ammann recommends a different approach. "We have to train community workers, mid-level health care workers to do what is being done in other locations." Global Strategies has raised more than $22 million toward HIV prevention, trained about 5,500 health care workers and provided HIV testing kits or drugs to 85,000 women in poor countries. Now the non-profit has started to advocate in the countries where it operates for stricter laws to protect women and children who are most at risk for HIV. 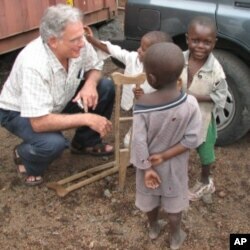 Now 73, and retired from medical practice, Arthur Ammann remains active in the fight against AIDS. He says he will keep going as long as he can because the need to protect women and children continues, because he finds the work rewarding and, he says, medical advances are too exciting for him to stop.